Twenty-one Bands of America Regional Championships are being held this fall across the nation. Bands of America Championships are recognized as the premiere high school marching band events in the United States. 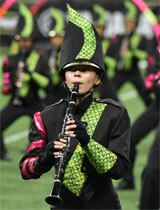 Get complete results and event coverage at www.MusicForAll.org. • Tickets are available online at MusicForAll.org or by phone at 800.848.BAND (800.848.2263). • Online tickets must be ordered at least two weeks prior to the event. • Tickets are also available at the gate on the day of the show. • Video or audio recording equipment are not allowed in the stadium. • Any still type camera may be used. Family, friends and fans may take still photos of BOA events for personal use only. The images may not be sold or otherwise distributed, without the written permission of Bands of America (or Music for All). Any still camera (making film or digital still pictures) is allowed into and may be used from the spectator seating area of any venue. Cameras (of any kind) may not be used on the field. People with field passes or name badges must go into the stands to take digital or film pictures. Tripods or other similar equipment that may obstruct the view or path of travel of others in seating areas are also not allowed. Bands of America is a program of Music for All. Since 1975, MFA, through its Bands of America and Orchestra America programs, has been a destination and set the standard for scholastic music ensemble performance and student and teacher education. A 501(c)(3) not-for-profit educational organization, MFA uses its national profile programming to model, showcase, recognize and provide individual, teacher and organizational examples of music performance excellence and achievement. MFA's programs include 20 annual events, including the Bands of America Grand National Championships and Regional Championships for marching band; the Music for All Summer Symposium camp for students and teachers; and the Music for All National Festival for concert bands, orchestras and percussion ensembles. Music for All's programmatic model is designed to mirror and supplement the classroom and performance model adopted in most American scholastic settings. Music for All values and promotes societal recognition of music education and active music making as essential and core parts of every student's educational development.